If you have ever had the good luck to eat at Maha, you have probably tasted the truffled fava puree. I have eaten it each time I have been there, and though it may not look like much, it packs a delicious punch of flavour that makes me go weak at the knees. I’ve wanted to try making this ever since the first time I ate it, and I finally went searching for a recipe after my latest visit to Maha. I found the recipe on the SBS food site with a video demonstration by Shane Delia himself. It is one of the recipes featured on his program Spice Journey. Strangely, the recipe on the website differs in technique to the video so I am sticking with Shane and following his directions. 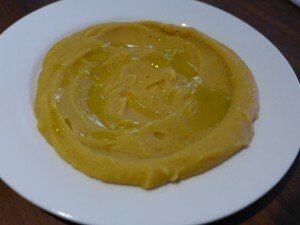 It is part of a larger non vegan recipe, but the puree itself is vegan in the original. I had assumed that the name of it meant that it contained fava (broad) beans, but in fact it is made from yellow split peas. It is smooth, sweet and unctuous with the heady flavour and aroma of truffle. Rinse the split peas until the water runs clear. Add the vegetables and split peas to a saucepan, just cover with water. Cook over a low to medium heat stirring occasionally until everything is soft and breaks down. Puree with a stick blender until utterly smooth. Add the truffle oil and salt to taste. Drizzle with some extra truffle oil. I made half the original recipe. Beautiful! I must give it a go this winter.